Gstaad is the Switzerland ski resort of fame and fortunes, with some of the finest five star hotels in the Swiss Alps. An historic ski haven since 1905 with the 1st Swiss chairlift installed in 1945, Gstaad is actually nine separate ski areas that sprawl from Zweisimmen to Saanemoser to the top of Les Diablerets Glacier 3000, few of which are interconnected. Gstaad itself is a glamorous alpine ski village with fancy boutiques and hotels, but the skiing is spread among the different mountains and various lifts (despite the one confusing trail map) with ski lodging from Rinderberg to Saanerslochgrat and Hornberg which are connected, to Eggli – La Vidamanette, La Braye and Gsteig. For families, Gstaad’s “Super Ski Region” offers the best skiing at Saanersloch and Hornberg called SnowParadise 2000 (for the 2,000m elevation or 6,500′). 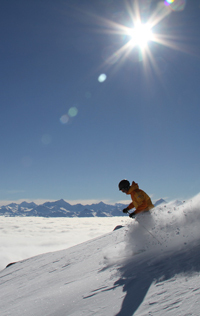 Here you will find children’s ski lessons, and plenty of well-prepared trails, with some off-piste powder in between. These friendly ski slopes of Gstaad are loaded with Swiss chalets for lunch, even an Igloo village made entirely of ice, a BMW race course, and a few terrain parks. The ski lifts are a mix of old and new – like the village of Gstaad itself, which is not actually slopeside. These Gstaad Alps are lower elevation, with skiing only through mid-March. Only the Glacier 3000 section, nearing 10,000′, is open October to May. Gstaad’s most scenic skiing is Glacier 3000, a 15-minute drive from downtown Gstaad and two tram rides to the upper mountain plateau. The Devil’s Thumb rock formation is stunning as are the views of The Matterhorn and Mont Blanc. Glacier 3000 ski terrain is all easy intermediate on top, about 5 well-groomed wide runs served by 3 long T-Bars, the skiing is high and heavenly despite the devil /diable references. On a clear day, Glacier 3000 is beautiful for any level skier. Below the gently pitched summit plateau, a quad chair serves a one steeper prepared trail on the front side (and plenty of steep off-piste terrain which warrants a ski guide). We recommend a super scenic lunch at Restaurant Botta – the modern mountaintop lodge designed by Swiss architect Mario Botta. Families should download at the end of the ski day, the off-piste run back to Col du Pillon is crazy even with a guide to skirt you around the major cliff bands. And the long black run to Reusch is a true black diamond challenge as well. Gstaad Ski Lodging is plentiful, and chic, with has some of the best hotels in the Alps. Five star Grand Hotel Park, Alpina Gstaad, the Gstaad Palace are beautiful, but you need to drive or take a shuttle to the ski slopes. The Grand Park Hotel does shuttle its guests in beautiful Land Rovers. Gstaad village is delightful with designer boutiques, Swiss chalets, après ski and dining, very posh and pricey. Saanenmoser is centrally located in the middle of the biggest ski region, ideal for families wishing to ski without the concern for driving, you can walk to Saanersloch ski lifts from Gstaad’s Golfhotel Les Hauts and Spa – a family run chalet hotel. In Zweisimmen, for true ski in ski out lodging, The Hamilton Lodge is a cool chalet right on the ski trails, mid-mountain reached only by the Zweisimmen-Rinderberg gondola. Gstaad is called the St Tropez of the Alps, with French and German influence and Swiss sophistication, a dreamy ski destination for a family ski trip complemented by high-end shopping, spas and top Swiss hotels. 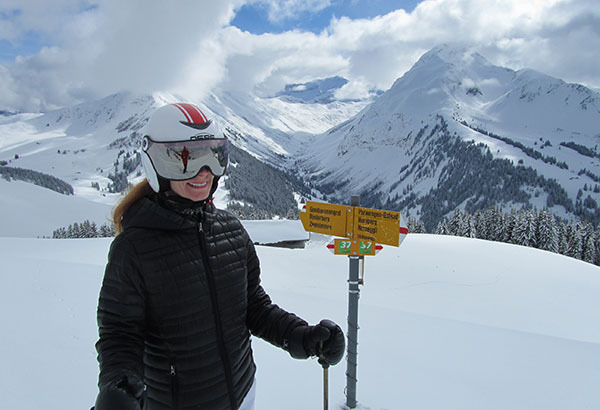 Gstaad Stats: 9,843′ summit, 6,398′ vertical, 53 lifts, over 136 miles including 103 prepared ski trails plus off-piste and glacier skiing. Traveling to Gstaad: Fly into Geneva or Zurich. The train to Gstaad is about 2.5 hours from Geneva and 3.25 hours from Zurich.